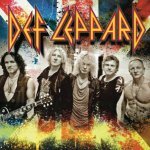 Def Leppard played a show in Skanevik, Norway on 6th July and a second online review and photos have been posted. Tysnesingen have posted a review of the show which took place at the Blues Festival. Two photos are included. Other links to photos from this show are available in the News/Media Links section. "The first real song was surprisingly enough a cover of Sweet Action. So came the catchy Animal, where the muscular Phil Collen still had shown that he is a whiz with solo guitar."